Keratosis Pilaris (KP) affects about 40% of the adult population (including myself) and about 50-80% of all adolescents. KP is characterized by rough bumps that resemble “goose bumps” or “chicken skin”, usually on the upper arms, though it can also be found elsewhere on the body. Caused by the excess production of keratin, KP causes only cosmetic consequences, but there is currently no cure. Looking on the bright side, there are palliative treatments available, all of which involve a commitment to consistency of use. Creams that contain Tretinoin (the acid form of Vitamin A), Adapalene, alpha hydroxy acids or urea may be used to temporarily improve the appearance and texture of affected skin. However, once these creams are discontinued, the condition reverts back to its orginal state. 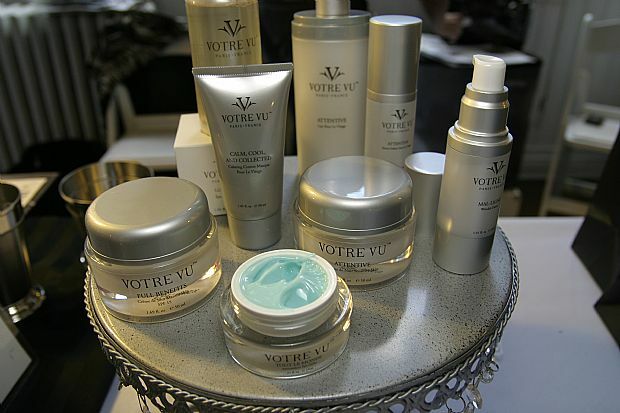 At the most recent Shecky’s Beauty Night Out, I learned about Votre Vu, a French luxury skin care company that offers national skin care products. Jean Louise Lilly, Director of Product Development and Marketing, recommended that I try Tragic Magic Rescue Creme for my Keratosis Pilaris. The cream’s power ingredients include jojoba oil, lime extract, rose hips oil, calophyllum oil and soja insaponifiables (a soybean derivative), vitamin E and avocado insaponfiables. So, how did it work out? After a few weeks of use, I saw a drastic change in my skin’s condition. The bumps were visibly reduced and the redness is gone. Usually, KP is most visible during the winter months, when moisture levels in the air are lower, so this is a big feat for both Votre Vu and me! Thank you, Jean Louise, for the samples and for helping me find a solution to KP! Anti-Wrinkle Cream in your 20s? I Love Ice Cream Cake!! !